SHELTER: Where I'd like to.. I think I'm drawn to the use of classic and modern elements in this room. The large windows and light quality are amazing. 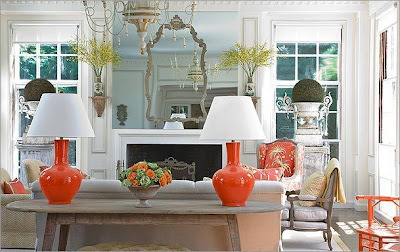 Oversized mirrors can look tacky, but layering the frame over the one pictured above this mantel works beautifully. I love that this room has a very soft neutral pallet, and with a few punches of orange, it was easily updated to the current season.. Enjoy the start of fall.. There is so much about this room that I love! The fireplace is really beautiful! The mirror thing really does work, I would not have thought so...I love the cool bluegreen punched by the orangecoral...one of my favorite combinations. Thanks for the post and for your beautiful blog!